Oh My! Just beautiful bakind Sylvia! 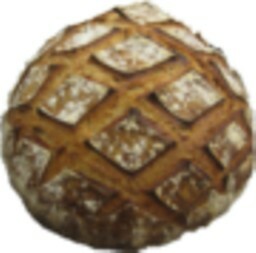 I feel like such a dummy - I didn't even know it was World Bread Day again! I'm just now making a levain for Friday'sbake and will have to come up with something for WBD - a little belated as usual :-( I went to get figs from my secret neighborhood source and they had moved - new owners and no figs from now on. They thought I was a little crazy for asking. Oh well, great while it lasted. I've got to get the jam machine before the citrus gets ripe and it is time for mega marmalad. Not that your regular WFO pizzas aren't terrific but that the plank pizza is killer. 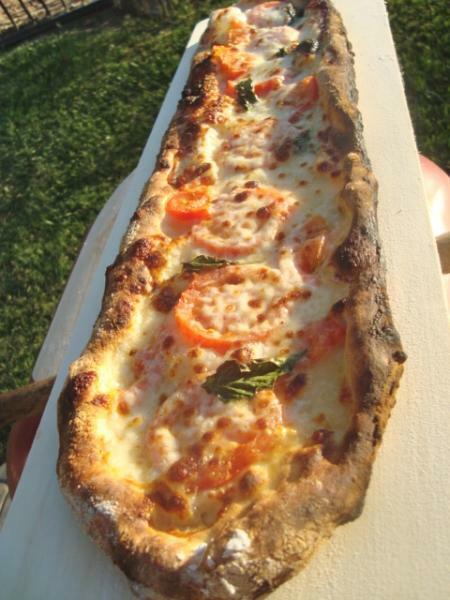 Imagine a pide that big! Thanks for the great post and reminding me of WBD too. So glad you liked the pizza's. You make me smile with pide : ) I do love Pide with lot's of filling's of green's and cheese sooo yummy. New neighbor's..well they probably didn't have any figs left on the tree. Maybe bribe them with some of your delicious bakes and that includes smoked meats..I bet they will gladly hand some figs over next season. So many uses for jams and jellies like basting, salad dressing, cookies, cakes, pies, tarts, you name it and jam it 'lol'. 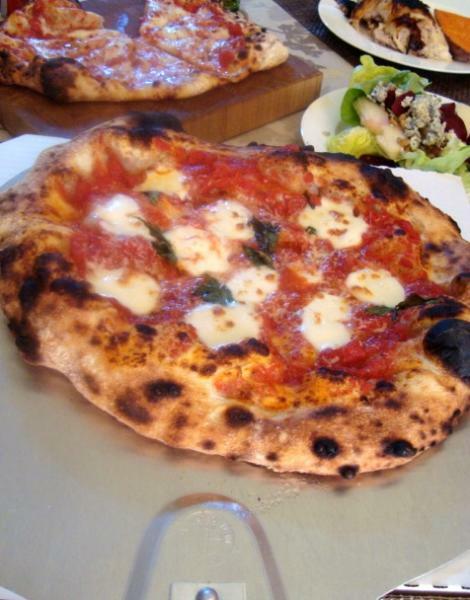 Wow, you make the most delicious-looking pizzas (the plank pizza such a great shape)! Your fig cookies and apple cider jelly are lovely. it's always inspiring to see all of the beautiful things you make. It's always a pleasure to have your opinion on what I bake. I'm happy to know you enjoyed the my post and have been an inspiration to bake. Richard Miscovich. Thank you for the suggesting the book. It's very well written and of a very nice quality to add to my growing wfo books. I'm so glad you are liking Richard's book! (I just placed my order for it & looking forward to some good reading when it arrives). What a lovely tribute to WBD. That's great looking pizza. I really like the plank shape. As always you did a fine job on everything. Thanks for the tip on storing high-hydration pizza dough. Also, your fig cookies look truly delicious, as well as the cider jelly. better one next go..at least it will be planned. and did it anyway. I just had to see if what I thought would happen 'did happen' to me. those bakery cookies. If I'm going to indulge, it has to be worth it. will make some more very soon. I always use the low sugar for jam/jelly as directed for the machine. Works and tastes great. I'm going to get a machine. I really want to start making my own jams and jellies. Charlene and I sometimes buy jams from a local store that stocks a variety of jams from Eastern Europe, which are very good. In the past, when I had a garden, I did a some canning. Once in a while our local supermarket has fresh figs but they usually only get one shipment and that's it for the year. Last time they had them I bought 4 baskets and made fig jam sans machine. I ended up with a couple of quarts, which turned out good. Hopefully, I'll have time to do some canning again in the not too distant future. By the way, that was an excellent post. I always thoroughly enjoy seeing your photos and reading about your baking adventures. for the kind words, Varda! Break it out I did. The weather has been cooling and I didn't want to have to be to careful firing it up to such a high heat. WOW! Awesome looking pizza. Now my dilemma is do I have sourdough pancakes for breakfast or pizza? Decisions, decisions . . . I always enjoy your posts! I do say! The thought of some sourdough pancakes sounds awfully good. I think, no I know, Mike would trade in some pizza for sourdough pancakes. He's a real pancake lover. I have to save them for special breakfasts...days he's not going out for his bike training and I can indulge myself. Not very often. Oh, we love SDP just as much as pizza. Mike really raved about this pizza. Said it was his very favorite. He just loved it for his late after work snack. It does warm up very nicely in a toaster oven. Great post, but then any time you you fire up the WFO it's a great post in my book, especially when you're making pizza. :^) There used to be a place in Vancouver that sold plank style pizza like yours in 4,8,12 inch increments that was pretty good but it sure didn't look as good as yours. 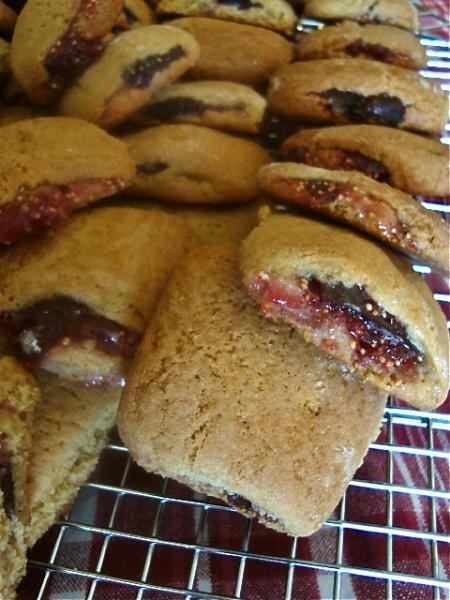 Love your Fig Newtons as well and can't recall ever having seen this cookie made from scratch. Was this a first time for you or have you made these before? They look delicious! I'm so pleased you enjoyed the post. I love those 7ft. 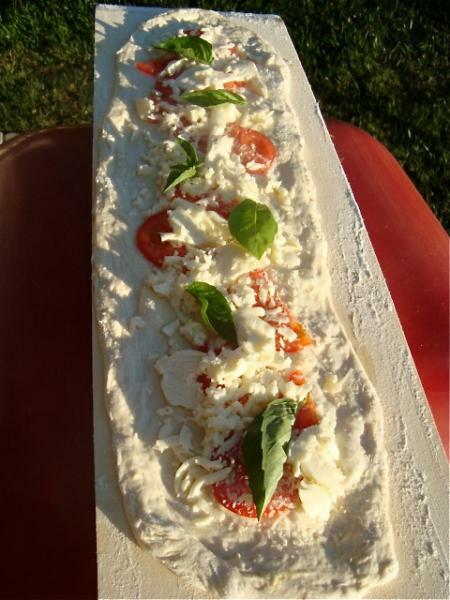 long pizza's pictures of the ones they make in Italy. This one was just right, any longer I don't think I would have had enough room to turn it. It worked out pretty good and I was pleased. 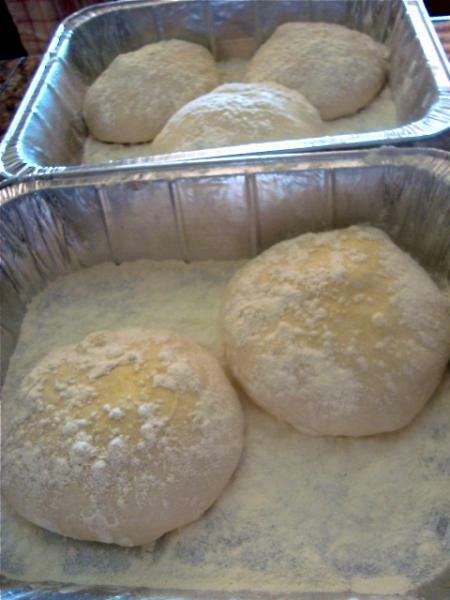 Although, it could have had the dough handled more gently and the crust would have bloomed up higher around the edges. Making a very attractive spotted, high blown crown. Next go will be better planned. These cookies are so delicious. I just couldn't get the link to work to the recipe. This was my first go at them and will be a favorite from now on. I have next years plans for all this growing crop of figs from my tree. The original recipe calls for using dried figs cooked down with some sugar. My fig preserves worked great. When you use dried figs. They have a different flavor. A lot of the natural sweetness is lost. I folded them completely wrong knowing something wasn't right. I thought I was making filled ropes 'lol'.